If you’re the type of driver who finds yourself worried about getting a speeding ticket, there’s a number of things you can do to help improve your odds to avoid a speeding ticket. Obviously you could aim to not speed, but there’s always the risk of inadvertently missing a speed limit drop zone, you can get popped even following the flow of traffic, or you may get zapped at the bottom of a downhill when your car sped up naturally, so it’s helpful to be aware of your surroundings so you can respond intelligently. Here’s a couple things you can do to help avoid speeding tickets. 1. Stay alert for cops up ahead. Use your eyes and look for the telltale clues of a police car up ahead. A car on the shoulder may be a cop, often shooting radar, and if they’re parked sideways on the road, they’re usually shooting laser out their side window. Being parked sideways is a very telltale giveaway. 2. Stick close to the flow of traffic. If you drive within 5-10 miles of the flow of traffic, you won’t stick out as an obvious target for police to go for. 3. Get a good radar detector. 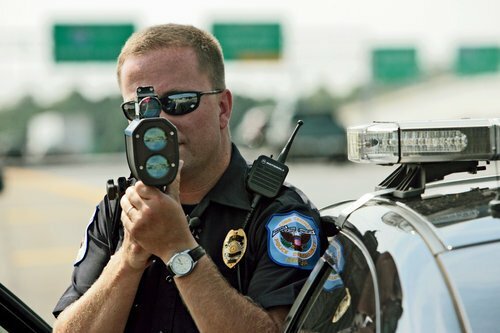 One of the most common ways that police give speeding tickets is with a radar gun. A radar detector will give you advanced warning so you can slow down before he clocks you. They will pay for themselves many times over. Avoid cheapy detectors though. They give very limited range and tons of false alerts so they’ll generally be more annoying than helpful. For my recommendation on good radar detectors, see my best radar detector buyer’s guide. 4. Install a good laser jammer. Police also use laser guns all over the country to give speeding tickets. A radar detector doesn’t help against laser so you’ll want to get a laser jammer like the AntiLaser Priority that can stop the laser gun from getting a reading off your car, giving you enough time to slow down, turn off your jammers, and let them clock you doing the speed limit. Learn everything you need to know about getting set up with laser jammers here. A “rabbit” is a car up ahead driving quickly that you follow from a distance. The idea is you give them some room up ahead of you and if a police officer hits them with radar or laser, they’ll draw fire and get the ticket instead of you. 6. Watch for brake lights up ahead. If drivers up ahead of you are suddenly braking, that can be a clue that they may have just spotted a cop. 7. Be extra careful when you’re alone on the road. If you don’t have a rabbit up ahead, it’s really best to stick to the speed limit. Without that added layer of protection, you’re easy pickings without a pack to hide inside of. 8. Check your rearview mirror. Police can follow behind you, do the same speed as you, and look at their speedometer to see how fast you’re going. This is called pacing and neither a radar detector nor a laser jammer will help with this. Keep an eye out for light bars on top of the vehicle and the headlights of the style of police cars used in your area. 9. Know the common hiding spots. Keep an eye out for common police hiding spots like underneath or on top of overpasses, highway onramps to clock cars from behind, or right after you crest the top of a hill. Slow down as you crest the top of a hill and check your side mirrors on on-ramps behind you. 10. Use apps that let you know where police officers are sitting up ahead. 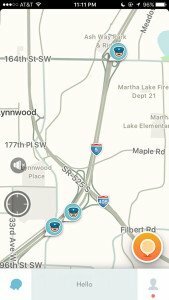 There’s free apps like Waze that are navigation apps that also have real time alert sharing capabilities meaning people can report where there’s things like traffic, accidents, or even police cars on the side of the road, potentially looking to give people tickets. You can run the app and see where other people have marked where cops are and contribute by marking any police officers you see as well. With these 10 tricks, you will significantly help lean the odds in your favor. While you can’t totally prevent yourself from getting speed tickets altogether, you can definitely help improve your odds as much as you can.